Stacy Tilton Reviews: Why yes, you can keep your hands clean AND soft! Why yes, you can keep your hands clean AND soft! My daughter is an avid hand washer. Sometimes it still amazes me that at 11-years old she washes them as often as she does. I guess as a mom I should be thankful because it could be the other way around leaving me nagging her to go wash before touching dinner. The one downfall is that through all that hand-washing she's now developed very dry hands. Sometimes so much so that they start to itch and bother her. I try to tell her to use hand lotion, but for a kid that's just another thing to try and remember. So when I stumbled upon Softsoap Hand Wash Plus Lotion I was actually quite excited. I immediately switched out our previous hand soap in the bathroom and had her start using it instead. Softsoap Hand Wash Plus Lotion actually has a touch of lotion mixed right in with the soap. That means no extra step of trying to remember to put lotion on after washing for my daughter. And no more mom having to say - did you remember put on lotion? I'm sure you all know how much kids love when we "nag" them as they call it to remember to do something. So I'm definitely all for skipping that reminder! 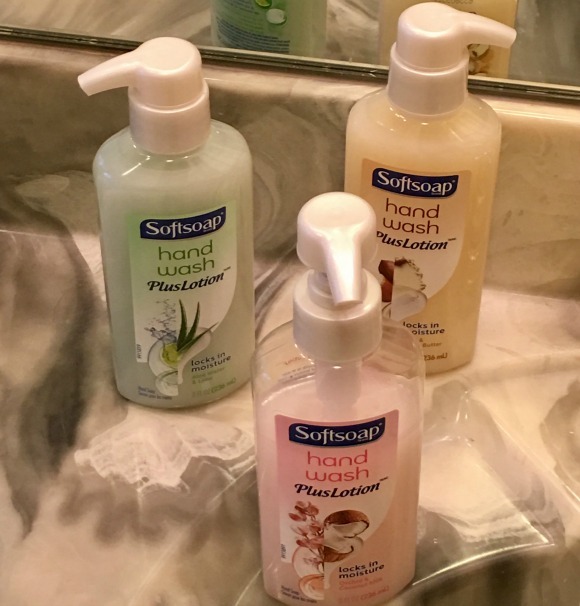 Softsoap Hand Wash Plus Lotion comes in three different scents including: Orchid & Coconut Milk, Shea & Cocoa Butter, and Aloe Water & Lime. I'm not sure which is my favorite between them, but my daughter says the Orchid & Coconut Milk is hers because it reminds her of spring flowers. Be sure to check out the Special Offers page on the Softsoap website for all the latest savings! I'd love to try this. My hands get so dry in the winter...made worse by the handwashing and I don't always take the time to put on hand cream. I think the Orchid & Coconut Milk scent sounds nice. I use SoftSoap all the time. One of my favorites is their Strawberry Scrub bodywash, but I love anything with coconut scent, too. Oh these look wonderful! I get such dry hands from washing, I really love that this has the lotion in it! I think my favorite would be the Shea & Cocoa Butter! This time of year is really bad on my hands, they get to cracked and actually bleed. I wash them a lot so that's part of the problem, definitely have to give the Softsoap with lotion a try! Softsoap is a favorite brand of mine for hand wash. I actually have a bottle of the Shea & Cocoa Butter and like how it makes my hands feel soft and clean. We use the Softsoap brand and really like it. It has always worked well and it is so convenient to. I like how they do have lotion and are less drying, my hands take a beating.